Oh, wait, no. He's coming to Vermont. 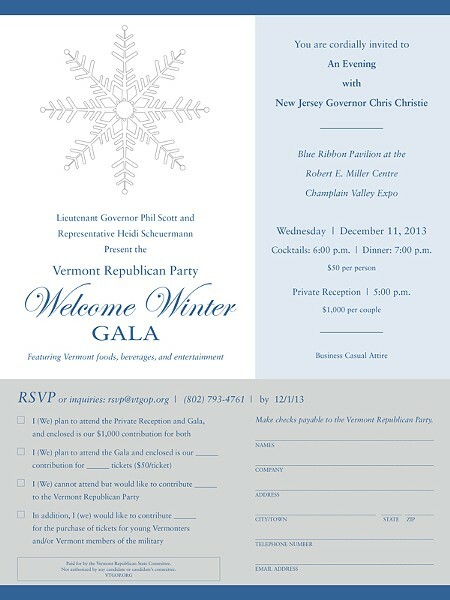 The Vermont Republican Party announced Thursday morning that Christie will headline the party's "Welcome Winter Gala" next month. The fundraiser will take place December 11 at the Robert E. Miller Expo Centre in Essex Junction. "There's just so many similarities between Vermont and New Jersey from a political standpoint, and I like the fact that Chris Christie speaks his mind and knows how to reach across the aisle as well," says Lt. Gov. Phil Scott, who organized the event with Rep. Heidi Scheuermann (R-Stowe). "We were interested in how he's been successful in New Jersey and what he's been able to do there in bringing people together," Scheurmann says. After handily defeating Democratic state Sen. Barbara Buono 60 to 38 percent in Tuesday's election, Christie's stock as a potential 2016 presidential candidate continues to rise. Next year he's slated to take over the Republican Governors Association. Vermont Gov. Peter Shumlin currently serves as chairman of the Democratic Governors Association. "With Shummy at the DGA and both of them very quick on their feet, it should be very interesting," Scott says. Tickets to the 6 p.m. cocktail hour and 7 p.m. dinner will go for $50, while a 5 p.m. private reception will cost $1000.